Mindfulness for children has became a very popular tool taught in schools. Because sadly more and more children are suffering from anxiety, stress, depression and over-stimulation. We know how much pressure society places a on adults but also children and teenagers. But with modern day living, many children are becoming addicted to technology, sugar and other unhealthy habits from a very young age. Unhealthy patterns that can seriously impact the quality and potential of their adult life. Meditation and mindfulness for children can actually reduce many of these habits. Meditation can support a child in many ways, in-fact in many ways meditation can be your child’s best friend. Here are a few reasons meditation and mindfulness for children is a highly beneficial life skill. Meditation And Mindfulness Can Help Reduce Anxiety, Stress And Depression– Sadly more and more children are struggling emotionally and mentally through over-stimulation, chronic anxiety and depression. Meditation and mindful activities encourage the body off the stress response into the calm response. A reason why mindfulness for children has became the latest skill in many schools. Meditation and Mindfulness Calms The Monkey Mind– Children now have an amazing ability to grasp new tasks and activities. But are struggling to concentrate or just be. Look how toddlers quickly grasp how to use your mobile phone or ipad. Like adults these devices become too addictive and distracting. Their minds get used to darting to different things and lead to poor concentration, a verylow attention span. Young children are forgetting how to be care-free, relaxed and content. This is not healthy, this is what causes anxiety, stress and over-stimulation. Mindful activites and meditation techniques loosen the attachment to the monkey mind. And in many ways re-teaches the mind and body back into balance. That is why mindfulness and meditation is a popular self help tool for kids with adhd, autism and aspergers . Mindful Activities And Meditation Encourages Confidence– Lack of self-esteem, self-worth and confidence are all triggered and caused by our mental beliefs, by over-thinking. When a child learns to let go of these self-destructive tendencies they become more calm and confident. Your child recognises they are enough, they are not their thoughts. When we access a place of deep peace regularly we are more at peace with ourselves. I have witnessed many children with various disabilities and challenges completely change in attitude, confidence and ability through learning meditation. You would be surpised how powerful these skills can be when encouraged in a child’s daily life and way of being. Mindfulness And Meditation For Emotional Resilience – We all have different life challenges and emotional pain to varied degrees. But how we view and approach these life challenges is what makes us struggle or suffer. The right mindful and meditation tools can teach your child how to accept their pain, accept their emotions without judgement. When we allow our pain to arise and flow in acceptance, we reduce reaction, fear, destruction and denial. 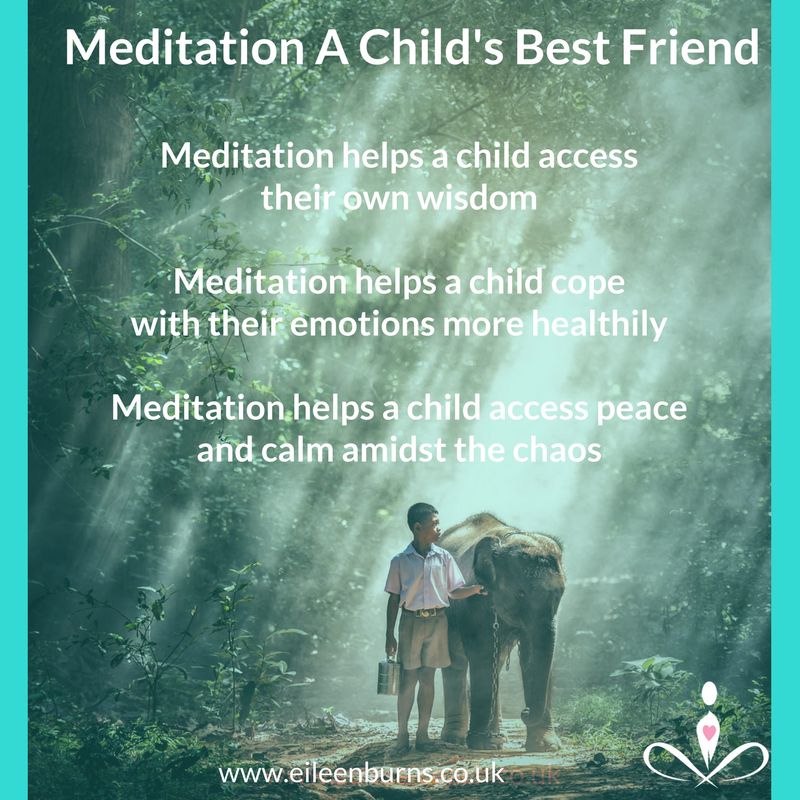 An emotionally healthy child is a happy child, a child who creates happier and healthier communication skills and positive relationships.That is why the right meditation course builds emotional resilience. Daily Meditation Encourages Healthier Sleep Routines– It is much easier for any adult or to mentally, emotionally and physically switch off when they have been calm. Many parents are so focused on physically tiring their child out to get them to bed and off to sleep. But there is a huge difference between physical tiredness and mental tiredness. Mental tiredness is often mental stimulation and one of the biggest reasons children and teenagers don’t want to go to bed. With so much information and technology overload, many kid’s natural circardian rythm is out of sync. Daily meditation and mindful activities naturally encourage the mental and physical body back into its natural circardian state. As a meditator for 25 years who has taught meditation to all ages including children for over 16 years. I have witnessed how much meditation can change the way a person approaches and lives their life. Originally published at eileenburns.co.uk on February 13, 2018.